January is the time of year I enjoy going to places like the Jewett City Flea Market, taking my time and browsing through the boxes of the old all-occasion cards, from the 1950’s and 1960’s, booths and booths memorabilia and antiques, looking for that special find that means something special to me, maybe look at the old linens, handkerchiefs, that have that special look and feel that offers to me a memory in my mind of something I enjoy having in my life, to purchase and bring home with me. A little antique store in Taftville, CT, Johnny Kielbasa’s has an array of collectibles to look at. One, that caught my eye, was a Currier & Ives print, that reminds me of my Aunt Lillian’s and my Grandma’s home when I was a child. Currier & Ives seemed to be able to capture that feeling I had as a child visiting in Franklin, CT at Christmas time and in the Winter and where I grew up in Occum. My mother had a Currier & Ives calendar when I was a little girl, and I would look up close at the picture of the winter scene in January, a new year, and study how he captured the feelings and colors, of my winter scene in my eyes as I stepped outside my front yard on a cold Winter’s day. The colors at dusk in the winter sunset, the the contrast of the white snow, and dark branches of the bark on the trees with the soft shades of the sunset in the background the light hitting the object of a colonial home or bank of snow, with soft golden, lavender, tones with hues of soft pink, deep green pine trees foreground, setting forth a sense of forbidding calm in the outdoor winter scene. Currier & Ives captured to me that feeling I had as a child when I looked about outdoors at the winter scene before me. In January, I visit my favorite shops in this New England area to purchase such an item as a Currier & Ives print. 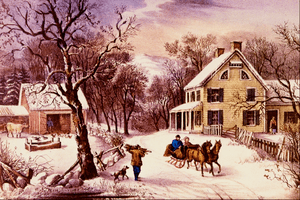 This entry was posted in Uncategorized and tagged Currier & Ives, New England, New Year. Bookmark the permalink.